Continental's Grand Prix Attack/Force Tire Set benefits from Continental's ultra-dense Black Chili compound for a fast roll with extended durability and exceptional grip. With a 22mm contact patch up front, and a 24mm width for the rear tire, the Attack/Force Set delivers a superb blend of aerodynamics, power transfer, and handling that traditional sets can't touch. The Grand Prix Attack/Force Tire Set includes the Attack Front Tire in 700c x 22mm (22-622 ISO) and the Force Rear Tire in 700c x 24mm (24-622 ISO). Each features a 3 ply casing for a total of 330 TPI. 110-120 recommended PSI. Claimed weights: 175 grams/195 grams. Black. I got some faster wheels so I figured I might as well get some faster tires. These are fast. Continental tires continue to improve. 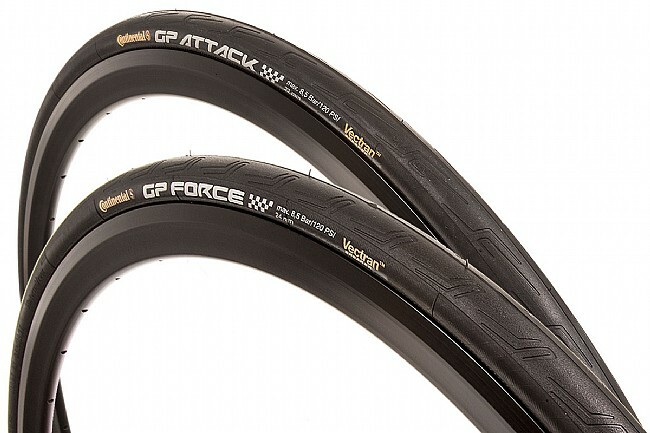 I have purchased many different Continental tires, over the last 15 years, and the new Grand Prix AttackForce models are the best yet! I had gone over to Michelin's Pro4's, which are very good, but the new AttackForce set is great! Great sale price, from Western Bike Works, also! Bullet proof tires, these have stood up well to the rocks and road debris in my area. The only flat I had was from running over a steel wire brush on the road, which any tire would not have survived. Conti is the best brand, these are the best tri tires. I was using 4000S chilis 25 rear, 23 front and just replaced them with the Attack 22 F Force 24R. Visually the AF combo is smaller with a slightly different tread pattern. They seem to ride a tad harsher. probably due to the size difference but they hook up with the road the same. These are hands-down the best cornering/handling tires I've ever used. They'r my new go-to tire. I love the feel of the road with these tires. I have used this combination for 2 years now. Not as durable as gatorskins, but the ride is wonderful. Use for recreational ride and love it so far. This is a great tire combo. They are light and fast. I've used the conti grand prix 4000 s in the past, but like this setup better. Fast, well made tire, excellent value on sale! I ride with a bunch of 50-60 year olds who like speed. They are also good when rides involve lots of climbing. I was riding on Schwalbe 1 tires for years and they are excellent... However there was one draw back... I was getting a lot of flats and ruptures in the side walls ( I must say though that the customer service was excellent.) However I just got tired of flats. I was looking for another tire to replace and read the outline on the Conti Attack Tires with the smaller in the front and the larger in the rear. So I thought that I would give them a try. I have a couple of hundred miles on the tires and they are nothing less than EXCELLENT. I have dropped the tire pressure to 105 and I still get the speed and durability (So Far.) I am very pleased with the tires and the ride is much, much smoother and just as fast. I would definitely recommend these tires. I mounted these on my Boyd 90mm carbon clinchers for my Tri bike. I've used them for a couple of Sprint Tris and a couple of TTs. My initial concerns over the stability of the front (being narrower than what I am used to) have proven to be unfounded as I haven't noticed any real difference. In fact, the stability of the front is probably helped in cross-winds with the narrower tire (22 versus the 25 I had on). These are fast rolling, stable, and grippy. Get a pair to upgrade your TT setup. I have been using Mavic tires for the past several years. 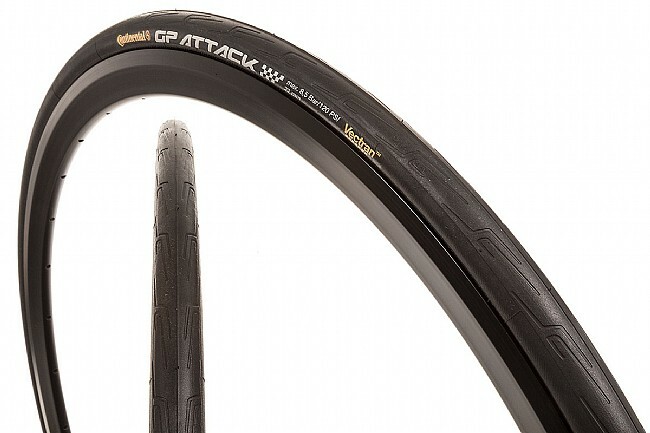 I wanted to try something new and so I bought the Continental Grand Prix attackforce clinchers. So far, I have been very happy with my choice. The ride is much more comfortable, handling is good and rolling resistance is better than with the Mavics. A solid choice! Good tire, nice to have wider rear and skinnier front with different compounds. Good tire, nice to have wider tire at 24mm and skinnier front at 22mm. The rear also has a harder rubber and lasts longer and and extra belt for puncture resistance. The front is softer for better steering. I can't understand why more manufacturers don't make rear / front specific tires it is a great idea from Conti! These offer a great balance of performance and durability. I ride a number of centuries and club rides each summer and am a pretty aggressive rider. I've had a few pairs of these and have found them to be quite durable and puncture resistant. They roll nicely and I've never had a problem with grip on fast descents or in the wet. My only dislike would be that the rear wears out quicker than the front, which is typical - but these are sold as a set. Not much to be done about that, but it is what it is. Hands down - the best set of tires for the money. Terrific durability - great for the those hard training days and or racing. (especially if you live in an area prone to flats.